These waka are for social, training and competitive paddling. Regular crews book a waka at a time that suits them and fill seats from the wider membership as needed. All waka bookings are to be done via Teamer. Tuhirangi is named after the guardian taniwha that the great navigator Kupe placed in Cook Strait. Mangoripi is Maori for thresher shark, which is a fast, strong swimmer. Mango Pare is Maori for hammerhead shark, which is a widely used symbol of strength, courage and determination. Anihau, which is Māori for gentle breeze. OC2 waka can be booked via Teamer once a good level of paddling competency and safety knowledge, including capsize (self rescue) capability and harbour rules, has been demonstrated. You must be a signed off by an approved safety officer prior to using the OC2s. OC2s have a rudder which is vulnerable when launching, coming ashore and storing. Your membership fees and fundraising activities by the club are used to purchase equipment and maintain our fleet. We are happy to supply the waka and equipment so you can enjoy paddling. The care of the waka (and other equipment) is the responsibility of all members. In particular, special care needs to be taken in launching the waka and bringing them out of the water after use. Washing the exterior of the waka and paddles after use is important to preserve the integrity of the materials and to extend the life of the equipment. 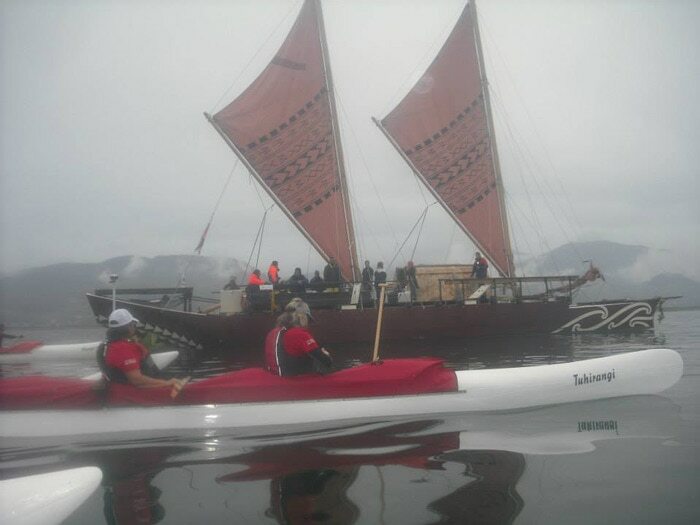 Care includes; paddle use and protocols (Maori Tikanga), reporting damage and any wear and tear observed and learning how to lash the kiato (outrigger) and ama (float) to the hiwi (main waka hull). All members are expected to help at working bees as required, to do any waka maintenance. Waka play an important part in te ao Māori or the Māori world. Māori trace their origins to ancestors who migrated here in voyaging waka bringing their history, atua (gods), customs, values and beliefs. Because of this, many waka ama clubs in New Zealand recognise tikanga or customs regarding the use of waka ama, including our club. These affect how we behave in and around the waka. Listening or participating in Karakia (prayers), used by some crews to start and finish their paddles. Not stepping over the hulls or hoe (paddles) out of respect for them and in reverence for the old belief that they embodied ancestors. Not poking our paddle blades into the ground for the same reason. 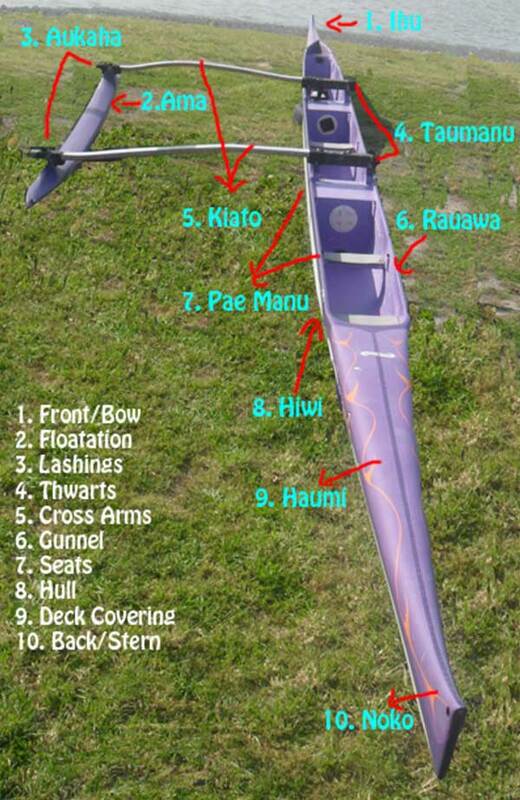 Understanding the basic Māori commands, which are often used when paddling. Trying not to swear or eat around the waka. Trying to live by the concepts of kotahitanga (unity) and manaakitanga (hospitality). You can find our karakia on the resources page. Ihu - The front of the waka. Ama - A long thin float attached parallel to a seagoing canoe by projecting spars as a means of preventing it from capsizing. Aukaha - Are the lashings used to secure the kiato to the waka and the ama. Taumanu - Crossbeams (also known as canoe thwart), that run on the inside the top of a canoe giving the hull support and strength. There are usually two thwarts on the inside of a canoe. From a practical standpoint, canoe thwarts are often used to strap gear to, thereby keeping it within the canoeist's reach and safe from falling out of the waka. They are also for lashing the Kiato to the Waka. Kiato - Are the cross arms that connect the waka to the ama. Rauawa - The reinforcing strip running along the top edge of the hull to which the thwart(s) are attached, usually made of wood, aluminum, or polyester. Pae Manu - The seats provided for the paddlers to hoe. Hiwi - A hull is the watertight body of the waka. Haumi - Is the deck covering on the front and back of the waka. Noko - The back of the waka. 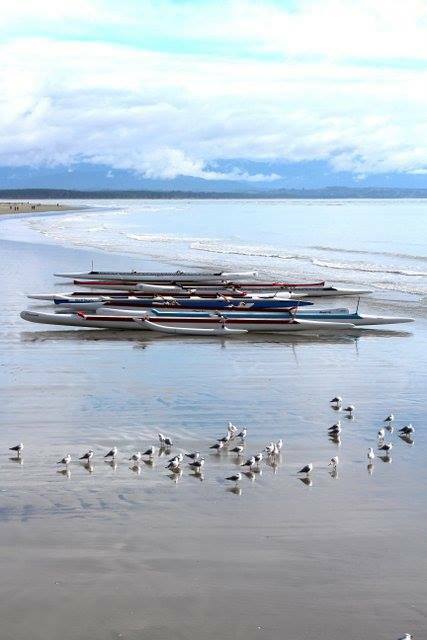 Waka ama or outrigger canoes have long been an integral part of the culture of Pacific people. The development of waka ama can be traced to the period of early Polynesian voyaging throughout what is known today as the Polynesian triangle (Hawaii, Rapanui, Aotearoa/New Zealand). Contemporary outrigger paddling has its origins in Hawaii. It was banned by the early missionaries, but revived in the early 20th century and really took hold after the Second World War due to new boat-building technology and the use of fibreglass. By the 1950s it was recognised as a sport internationally. In New Zealand renowned Gisborne-based waka carver Matahi Whakataka-Brightwell played a big part in the sport’s development and growth, as did Kris Kjeldsen, who developed the 1990 model canoe when New Zealand hosted the world sprints. Maitahi waka greet Haunui, Te Toki Voyaging Trust's doubled hull sailing waka, as she comes into Nelson, 2014. 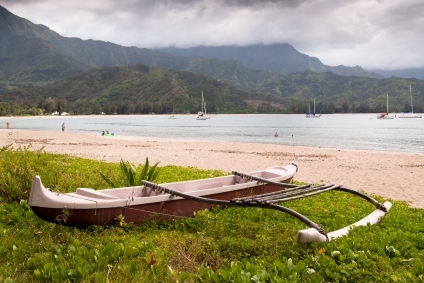 An outrigger canoe sits along the beach on Hanalei Bay, Kauai, Hawaii. 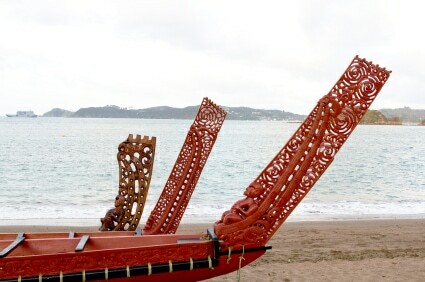 Three beautiful wooden carved Māori war canoes on beach in Waitangi.